It's common knowledge that clean skin helps to keep acne, whiteheads, blackheads, and large pores at bay. What's less commonly known is the best methods of cleansing, and how to optimise skin cleansing regimens to suit each individual skin type. 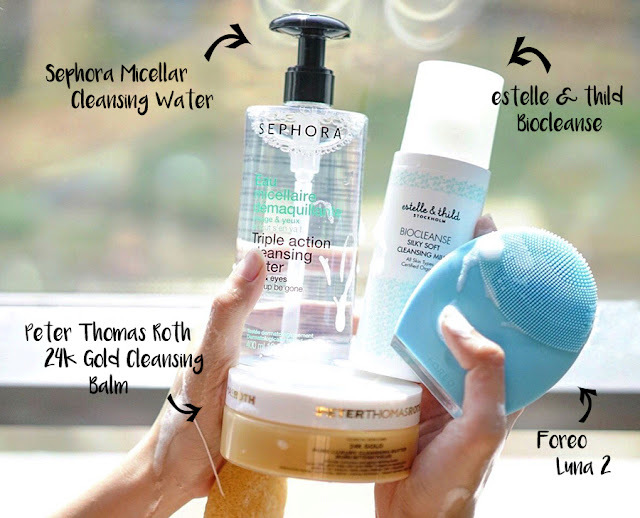 Sephora recently launched a Magic Cleansers campaign promoting their cleansers and cleansing tools, and I say it couldn't have come at a better time. The market is saturated with all kinds of skin cleansing solutions, so it's easy to become a little lost because of the sheer magnitude of options you have in front of you. 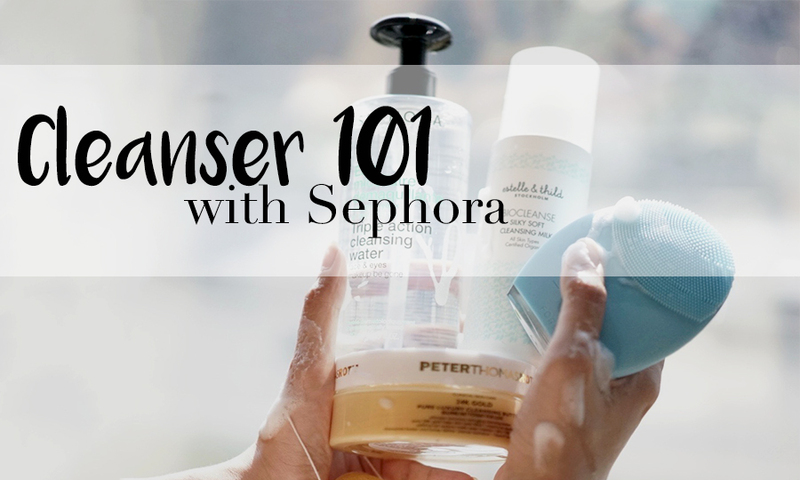 I received some options for combination skin from Sephora, and here's what I feel is the best way to cleanse your skin without stripping it of its essential moisture and balance. 1. I always, always recommend using a cleansing oil of some sort as a first step in cleansing each night. The Peter Thomas Roth 24k Gold Cleansing Butter is a great (albeit a little pricey) option, that really leaves your skin feeling soft and hydrated. What's even better, this butter is mineral-oil free, so you're not going to clog your skin or cause breakouts if you're using this balm alone as your cleanser. 2. However, I will always recommend double-cleansing, and I love the estelle & thild Biocleanse for that because it's so gentle on the skin, and really cleans away any remaining dirt and makeup on the skin. This is great for acne-prone skin as it's cleans thoroughly but doesn't strip away any moisture from your skin. Some people might not like it because it doesn't lather, but lather does not equal clean, so bear that in mind when you're using this product and you'll love it. 3. I go one step further with my cleansing routine now because of the Foreo Luna 2, and I'm loving it because it really removes all impurities from the skin without being too harsh. Its silicone bristles also mean that it's very hygienic and it doesn't need replacement heads, which is a big plus, because that kind of money adds up! In case you're not familiar with Foreo Luna, it is a cleansing brush that you use to enhance the cleansing abilities of your regular cleansers. It is waterproof and rechargeable, so you can bring it into the shower with you and simply plug it into a usb charger to recharge. It is hygienic, easy to use, and comes with an anti-ageing massage function which is great to use when you're applying serum as you can really massage it into the skin. 4. And finally, I also recommend a good micellar water cleanser for a big night out, because you've got all that extra makeup on and it helps to remove some of it (especially the eye makeup!) before starting your regular cleansing routine. The Sephora one is affordable, and what's great is that micellar helps remove everything very easily, so you're not yanking and pulling at your face when you use this. Simply place a cotton pad soaked in the cleansing water on the eyes and let it melt into the skin a little, then gently wipe as you remove the cotton pad. It's great for preserving falsies when you're removing them, too. The Sephora Magic Cleansers campaign is still ongoing. Head into their stores or click here to find out the best cleansers and cleansing routine for you.